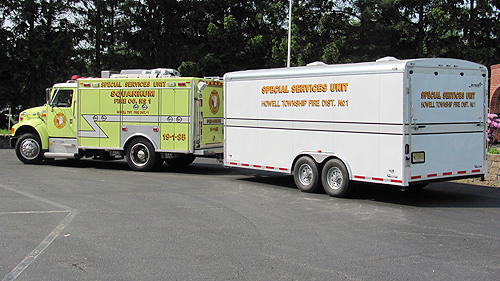 The Dive Team is based in Fire District #1, but serves the entire Township of Howell. The Team is a specialized unit within the Fire Company, comprised of firefighters from Howell Twp. Both Divers and Tenders are required to take many additional training courses beyond standard firefighter training, and also participate in monthly training exercises. All Team members are 100% volunteer. The Dive Team responds to many different types of incidents, such as boating accidents, submersions, persons or animals through the ice, and vehicles in the water. The Team also assists the Police Department with underwater search and recovery of items such as crime scene evidence and weapons.